Before I left the States my best friend’s mom, Carmen, and I talked about balance. She told me the key to being happy is to lead a balanced life. You have to balance your family, friends, love interests, work, pleasure, and personal growth. Since then, balance has become a personal mantra and daily focus. 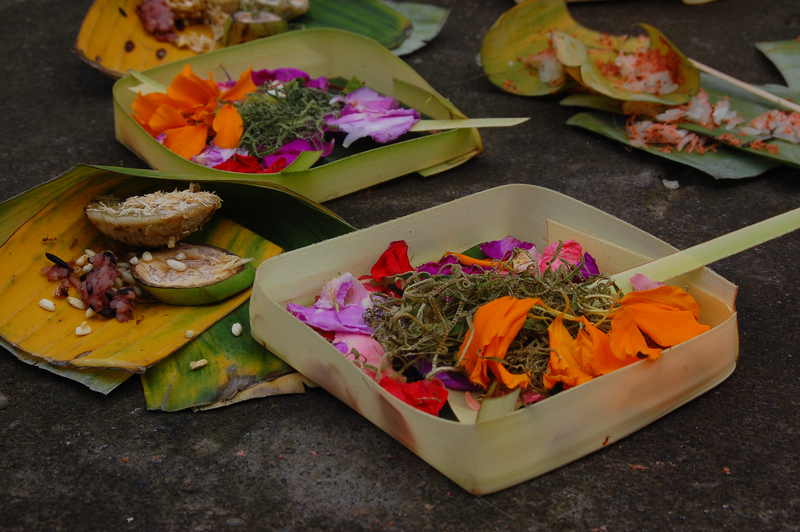 When I planned my trip to Bali I was unaware that Balinese culture thrives on the concept of balance. They believe in Tri Hita Karana, the philosophy that one achieves happiness through three harmonious relationships: human interaction with the divine, other humans, and the environment. Because of this, Bali is a haven for balance seekers. And, really, what better way to practice it than yoga? 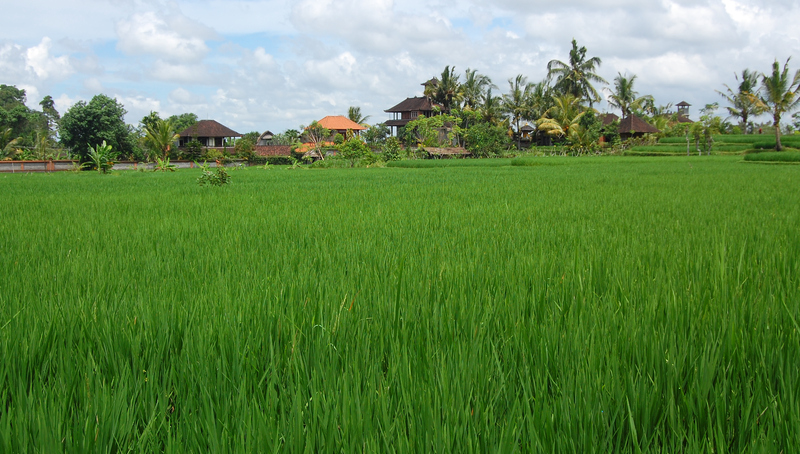 In Ubud, it’s hard to walk down the street without seeing a yoga studio. I signed up for classes at the Yoga Barn, and I’ve gone every day. One morning I decided to venture from the traditional classes. I chose Jungle Yoga. I was a bit apprehensive at the name, but if not in Bali, then where? I, of course, am late to class. Already sweating, I grab a mat. I plop in the back of the room and scurry into meditation pose. Now, in a typical yoga class the mats are situated so everyone has an equal amount of practice space. The room is balanced. And, ideally, you should be able to see the instructor from wherever you sit. In this class, I know the instructor is male because of his voice but I only see blond curls. A wall of middle-aged women (which I will call the Divorce Field of Desperation, DFD for short) blocks the rest of him. 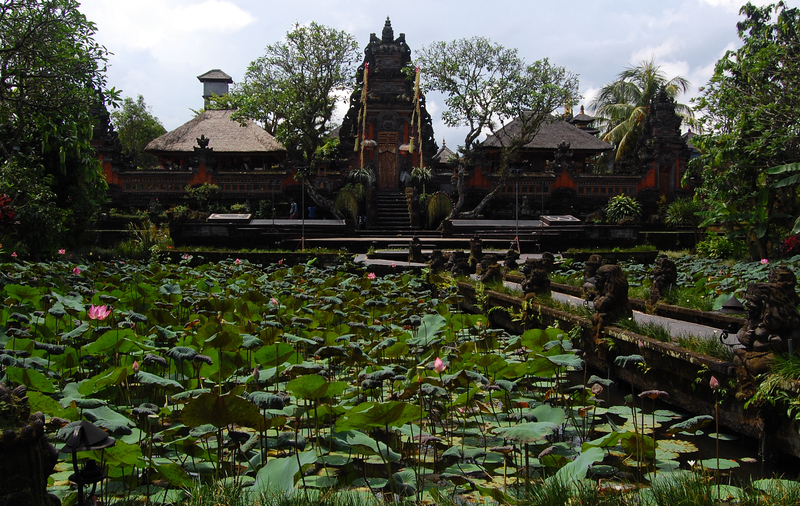 I had read that single women were flocking to Ubud after reading Elizabeth Gilbert’s Eat Pray Love. Apparently, most are recently divorced and hoping to find a Brazilian love interest (Who can blame them when Javier Bardem is playing the part?). These women fit the mold. As the rest of us sit on our mats, spaced evenly about the floor, the DFD clusters like a pack of hyenas at the front. Before class begins, the room is top-heavy and far from balanced. The instructor stands up. All I can think is Yoga Eye Candy. He’s on par with an Armani underwear model, sporting a similar lack of clothing but with an infectious smile. The Jungle Yoga teacher would resemble Tarzan. Anyway, he gradually moves along the DFD. As he fixes the women’s posture, they laugh nervously and lose balance. He wipes away their guilt and says, “Oh, the gravity must be a little off in this part of the room.” Then he smiles and winks as if they need more incentive to drool. An hour and a half later everyone in class, including all the men and myself, is flirtatiously giggling at our teacher’s comments. He ends class and the non-DFD members stumble out the room feeling a little love-drunk and ashamed. We meet at a communal breakfast table after Jungle Yoga. We were too distracted by the Tarzan Eye Candy to remember each other from class, but we start chatting and can’t stop. Now, if you don’t know me well, let me just tell you…I love to talk. I can talk to anyone for hours. I could probably talk to myself for hours. So, when I meet talkers, especially while traveling, I don’t let them leave me until they run out of things to say. I glance at our empty breakfast plates, a little confused by the point he’s trying to make. Then, he stands up. In the middle of the cafe, he stands up and looks straight at me. I look around. I’m a little worried he’s about to break into song or poem. His stance has musical potential. I nod, absorbing the advice that was poetically hurled at me. Walking back from breakfast I come across a group of Balinese women filling buckets with dirt. Two of the women help each other balance the buckets on their heads. I already have my camera out. In the developing world the stereotypical image of a woman involves her carrying something on her head. A jug of water, a bag of rice, or in this case, a bucket of dirt. I’m amazed how gracefully they balance and carry something so heavy. One woman notices my camera and turns my direction. I lower the lens. I’m afraid I offended her. After all, I’m a westerner, a tourist, and I’ve never carried a bucket of dirt on my head. There’s no way I can relate to her life. But she smiles, a deep and sincere smile. It’s the kind of smile I can feel in my heart. There’s a momentary, mutual understanding between us. I smile back. She turns and follows the other women down the road. I feel more connected with another culture, my environment, and myself than I have after any yoga class. It’s one of those fleeting travel moments I will never forget. 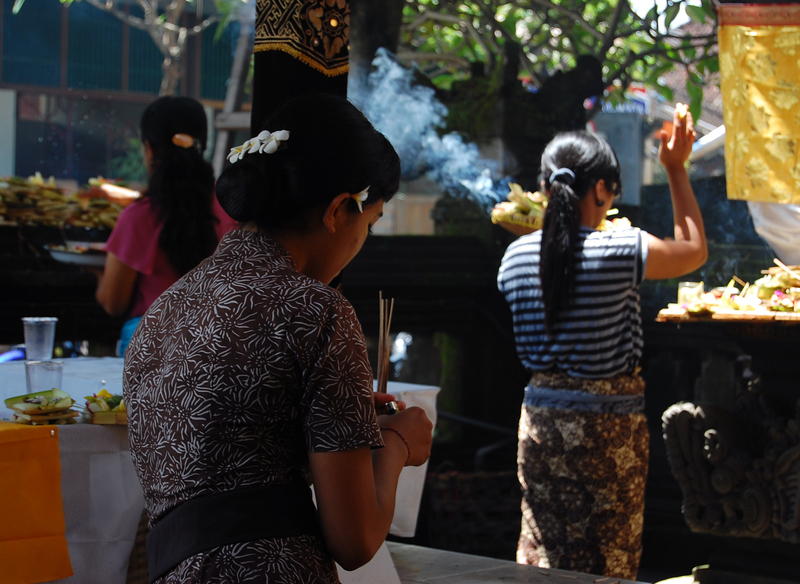 I think about all the women in Ubud searching for happiness. Will they feel more balanced when they get home? It’s possible. But there might be a simpler solution than paying for yoga classes and searching for a Brazilian soulmate. I think, sometimes, our happiness scale balances in mysterious ways. Maybe, if they simply stopped for a second and smiled at a stranger, they would find happiness in an unexpected place? But, I guess I wouldn’t blame them for trying their luck with some Yoga Eye Candy first. 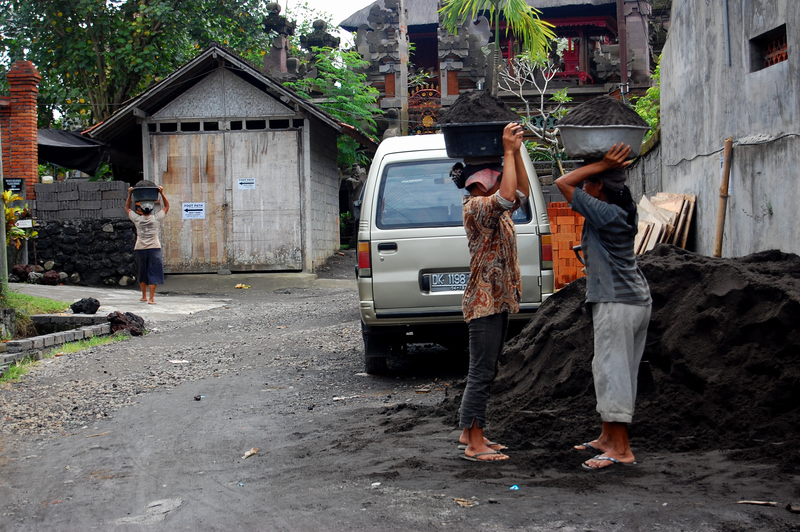 All I can think is, “Why would these women be putting dirt into very large containers to then carry on their heads back to wherever it is that one carries dirt in Ubud? From the photos you’ve taken it seems that there would always be dirt available nearer than further from where one might need it.” To me, this seems like some sort of Mr. Miyagi-esque lesson about balancing the world one container of dirt at a time. “Wax on! Wax off! Keep charging, Sugarbear. Haha my charging is more like a slow reluctant stroll right now. I’m losing momentum. Maybe island life will help me recharge? I told my balinese homestay dad in the car today that I was feeling homesick. His solution: bust out a clown wig, put in a celine Dion CD, and serenade me with My Heart Will Go On. Not sure it worked. But I guess only time will tell. This is exactly the sort of writings I really enjoy reading. You sound like a regular Paulo Cuelho. I bet you’ll blow that picture up, and frame it in a huge frame when you get home. Just a prediction, but probably accurate. Haha thanks :). Wait til you hear the story about how I got to the village I’m staying in this week. Its hilarious and just so absurd. Mom and dad are going to freak haha. Also, I think its ridiculous that in order to shower here I have to use a tiny bucket that I fill with cold water to pour over me or I go shower in the river, BUT I still receive texts from Vaughn in nashville walking around vandy’s frat row! Technology is amazing. And, what a nice girl too !